Super Monti saves Euro from temporary collapse. 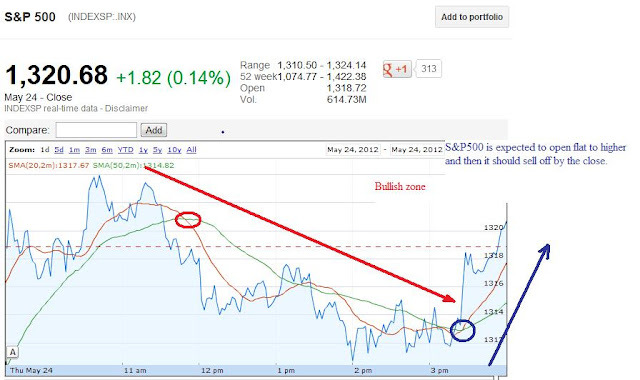 If you look at yesterday's Dow and S&P500 chart and compare it with today's chart, you will find lots of similarity. Both the days stocks opened flat, then it sold off followed by late rally. Today, Italy PM came in at perfect time to save Euro from collapse and gave the same old news which market wanted to hear about the Euro bond. He said "Majority of EU backs Euro bond". Stock market rallied on this news. If Monti news had so much importance, Euro should have crossed 1.26 but neither Euro or US dollar showed any interest in Monti news but Equity market liked it. As you know, Euro bond is not backed by Germany and without Germany Euro bond will never come into market. But this market likes even old news, because computers doesn't understand old or new news. If it's set to do certain function it'll do. Tomorrow will be another day with another rumor. Stock market and rumors goes hand in hand. As you know, financial market buys on rumor and sell on the news. Based on the chart, tomorrow market is expected to open higher or flat but at the close it will be in red. We cannot ignore the future market, or the rumor out of Europe and Greece which can completely change the direction of the market within seconds. 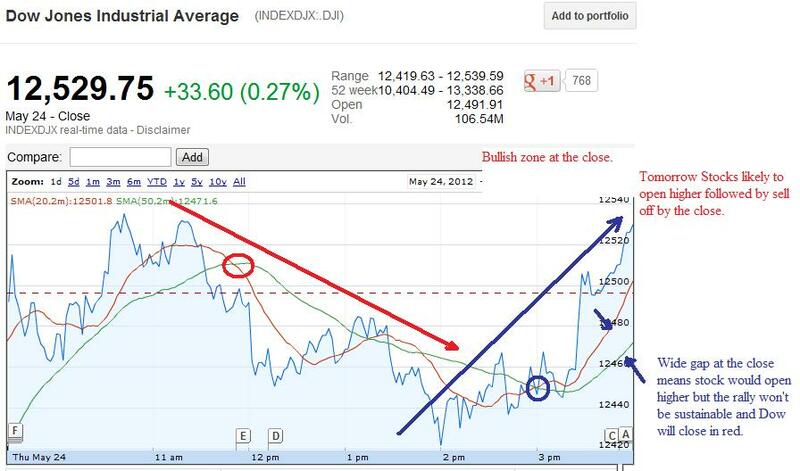 For Upside dow needs to break 12565, and for downside dow needs to break 12422 and close below that level. For Upside S&P500 needs to break 1328, and for downside S&P500 needs to break 1312 and close below that level. Consumer sentiment 9.55 am EST 77.8 is expected, higher is bullish while lower is bearish. Stock market is closed on Monday. So play this market carefully.